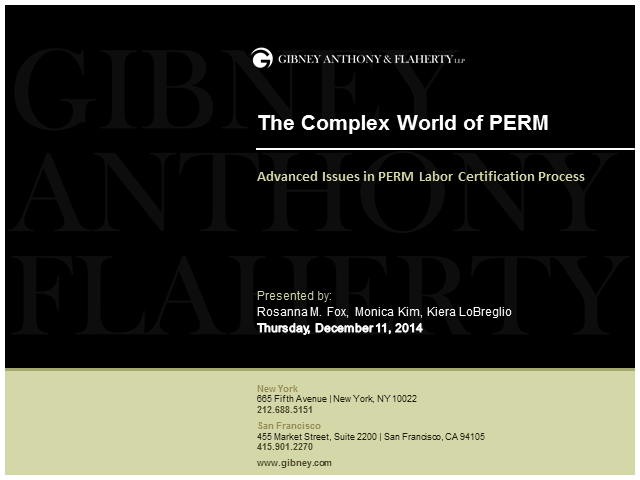 Please join Gibney, Anthony & Flaherty, LLP for a discussion of advanced issues, strategies and considerations arising in the context of PERM Labor Certification Applications. • Pre-recruitment considerations including drafting strategies, on-the-job training issues, employment verification letters, and prevailing wage. • Pre-filing considerations including the recruitment process, applicant assessment and layoffs. • Post-filing considerations including audit trends. Does your company employ foreign scientists or researchers coming to the United States? This webinar will discuss immigration options and what an employer needs to know when sponsoring scientists and researchers for U.S. visas. Gibney attorneys Deborah Davy, Mark Kingstone, and Maria Mejia-Opaciuch will discuss the criteria for transferring staff internationally to existing and new offices in both the U.S. and in key global destinations. The presentation will include discussions of specific visa policies and adjudication processes; of major trends in the various regimes governing the international transfer of key corporate personnel; and of related issues of concern to the employees, including employment options for trailing spouses, status options for unmarried couples, and paths to permanent residence for senior staff. * Immigration considerations for starting a business in the U.S.
Gibney, Anthony & Flaherty, LLP invites you to join us and Enrique Arellano Rincón Abogados, S.C. for this informative webinar. Gibney was founded with the simple mission of helping our clients achieve their legal, business and personal goals. With this philosophy, we have helped guide the operations of some of the world's best known companies from their initial stages to billion dollar multinational businesses.